Ceremony of officially handing over of the title deeds to the town took place on 7th August 1920 by Col. R.H. Carr-Ellison. 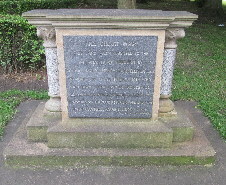 There is a flat-topped monument with a pillar at each side. It stands on two steps and a shaped plinth. A polished plaque at the front bears the dedication in sans serif capitals apart from the heading which is in elaborate capitals. On the back is another plaque showing the appreciation of the gift. The lettering is in sans serif capitals. Colonel Ralph Henry Carr-Ellison, C.M.C. Deeds of the park were officially handed over to the Urban District Council. 1. “There was some little trouble when the offer was first made” to present the park to the town, which had now been overcome. It was thought that the site should be used for housing. 2. From Hebburn, 3,000 men served and over 300 fell. 3. Col. Carr-Ellison said his grandfather and father had both said that an open space should be provided for the thickly populated town of Hebburn, and he was pleased to be able to carry out their desire. 4. “Complaints were made about the shortage of workmen’s trains leaving the town, and it was agreed to send a deputation to the NER company on the matter”. This was presumably so that people could attend the opening. 5. The park was also to commemorate the coming of age of Col. Carr-Ellison’s son, Lieut. John Campbell Carr-Ellison. Illustrated Chronicle 06/08/1920 reports official opening tomorrow; 09/08/1920 reports opening with photos. Northern Echo 11/11/1919 reports Col. Carr Ellison agreeing to open the park. North Mail 09/08/1920 reports official opening. Newcastle Daily Chronicle 15/07/1919 reports initial moves to reject the offer; 12/08/1919 reports decision to accept the offer; 14/10/1919 reports acceptance; 09/08/1920 reports official opening.